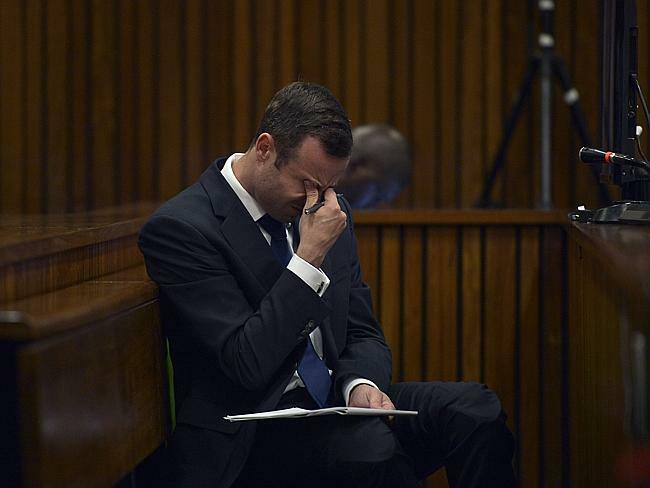 OSCAR Pistorius could not have been wearing his prosthetic legs – as he has claimed – when he used a cricket bat to smash open the locked toilet door in his apartment, his murder trial has been told. 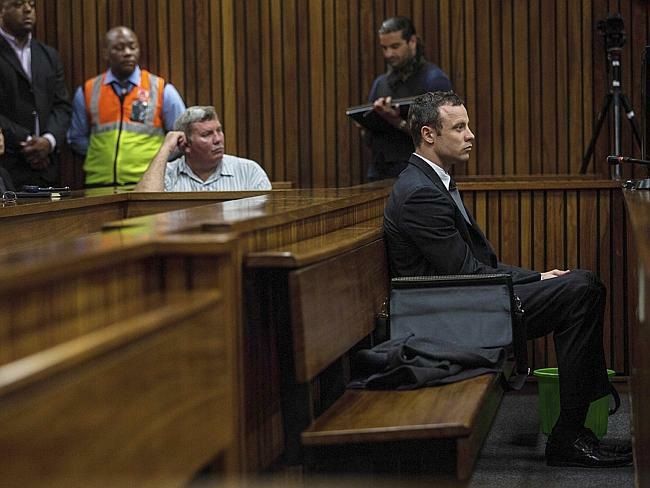 On the eighth day of the trial over the shooting death of Pistorius’s girlfriend Reeva Steenkamp, the prosecution set up a recreation of Pistorius’s bathroom door. 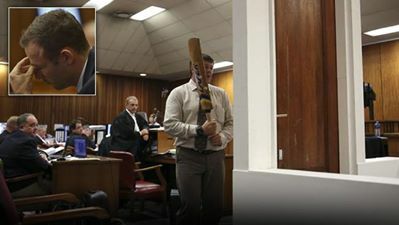 The door from Pistorius’s home, and the cricket bat he used to gain entry through it on the night last year that he shot dead Steenkamp, were used in a courtroom demonstration by forensic expert Colonel Johannes Vermeulen. Col Vermeulen placed the edge of the Lazer English Willow Club Plus bat into two marks on the heavy dark timber door, showing an exact match. One of the blows, just above the lock, had smashed through the door frame, allowing the bat to be used to lever open the door. 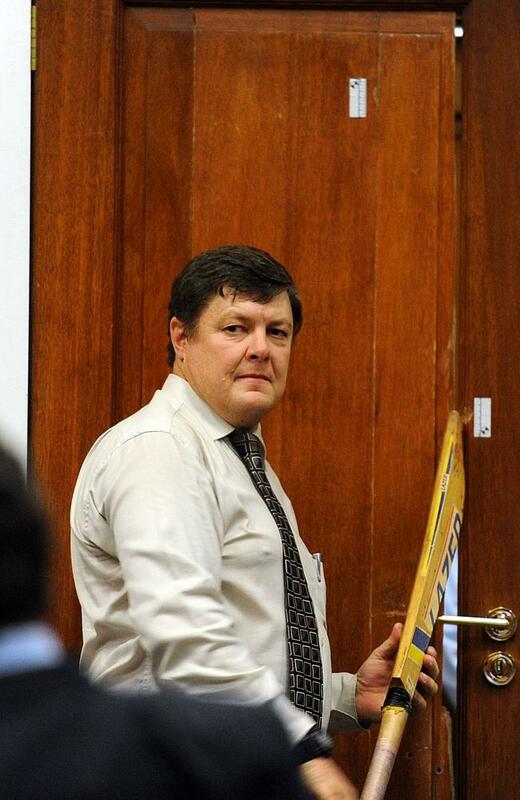 A 29-year veteran of over 1400 forensic investigations, the 1.85m tall Col Vermeulen got down on his knees to demonstrate his opinion that the angle of the bat when striking the door was consistent with it being held by a person with a shoulder height of 1.24m to 1.25m. 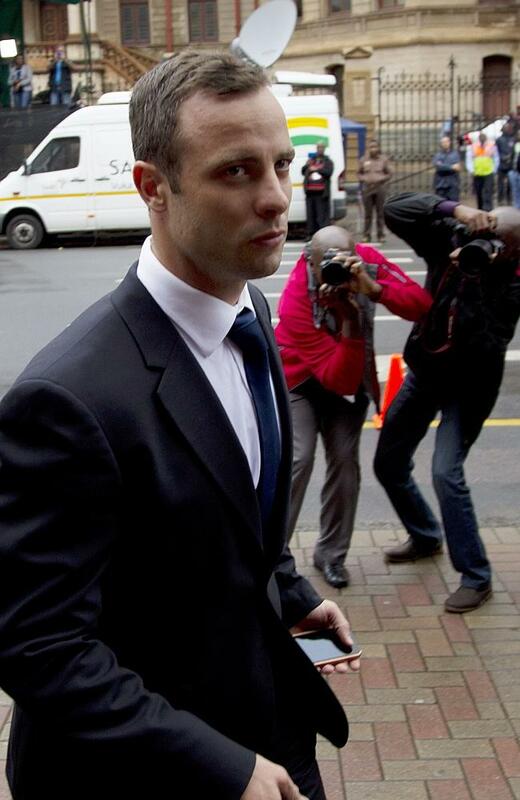 Pistorius’s shoulder height, when not wearing his prosthetic legs, is 1.25m. In his statement read to the court on the first day of proceedings, Pistorius said he was wearing his prosthetic legs when he hit the door to get to the stricken Steenkamp. 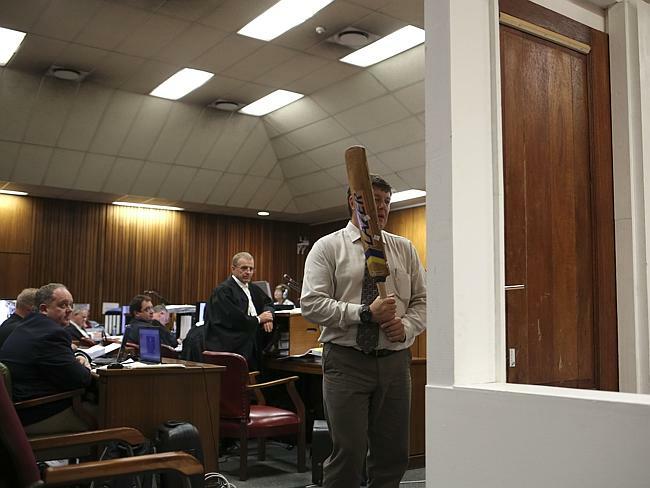 Defence advocate Barry Roux used the 45-minute morning tea adjournment to carry out his own experiments using the door and cricket bat. Under cross examination Col Vermeulen brought laughter from the gallery by saying he had noticed Mr Roux “running around” during the break. “Was I running?” Mr Roux asked. Mr Roux asked Col Vermeulen to again recreate the blow while on his knees. He then asked him to “lift your feet” and do it again. Vermeulen lost his balance. Mr Roux noted that Pistorius would have even less support than Vermeulen if attempting to swing a bat without using his prosthesis. “He doesn’t have knees,” he said, asking Col Vermeulen to try again. Mr Roux then asked the stocky, broad-shouldered Col Vermeulen to stand and place the edge of the bat into one of the marks, a request he achieved by standing back from the door, squatting slightly and bending forward. “So it fits?” asked Mr Roux. “It is an unnatural position,” he said. Mr Roux continued to push the witness. Col Vermeulen used an example of doing the dishes to explain the concept of “natural position”. 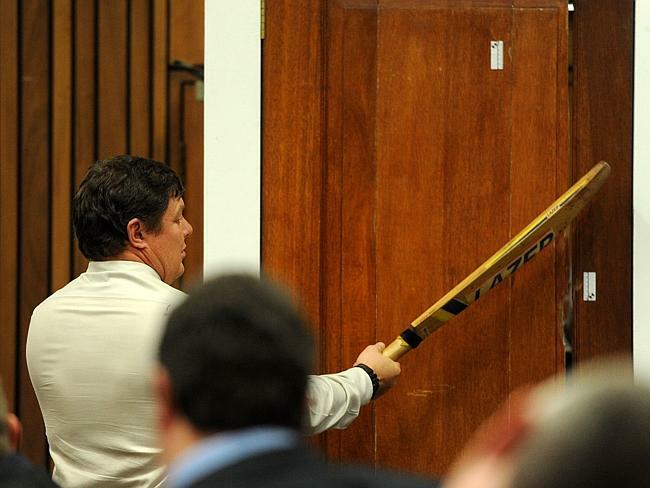 In a scene reminiscent of the “if the glove don’t fit” moment in the O.J Simpson trial, Mr Roux three times asked Col Vermeulen if the bat matched the mark on the door when he wielded it from the standing position. 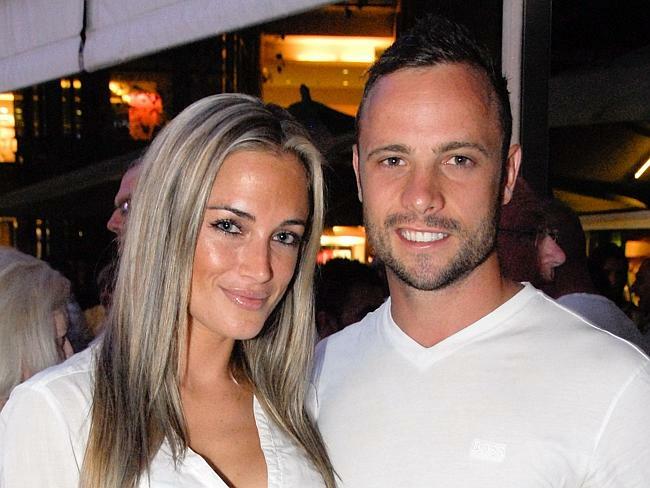 Prosecutors maintain Pistorius shot Steenkamp intentionally. He faces a life sentence with a minimum of 25 years in prison before parole if convicted on the murder charge. Last year, prosecutors maintained Pistorius was on his prostheses when he fired through the door, arguing the runner planned the killing while putting on his artificial limbs. In a reversal, prosecutor Gerrie Nel said in court Wednesday that he did not dispute the defence’s contention that the runner was indeed on his stumps at the time. The door has always been viewed as crucial evidence in the case, and was removed from Pistorius’s home in the hours after he shot Steenkamp on the morning of February 14, 2013. Mr Roux turned up the pressure on Col Vermeulen, saying he had failed to properly look at another mark on the door, a mark Mr Roux says was made by one of Pistorius’ prosthetic legs as he tried to kick down the door and which would be identified by a piece of sock fabric that remained lodged in the wood. In an evidence photo, a faint footmark on one of the door panels could also be seen. “It looks like a police shoe print,” Col Vermeulen said. “How did that come about?” Mr Roux asked. The colonel said he did not know. The lawyer also asked for a photograph to be shown with a partially obscured Col Vermeulen examining the door in a forensic room. The pieces of wood the colonel said he hadn’t been able to locate in his investigation were seen just behind the door in the photo. Col Vermeulen said it was only obvious to him then, standing in the courtroom in Pretoria around a year later, that the wood fragments he had searched for were right next to him at the time. It was kept by police but also taken back to Pistorius’s Pretoria villa with their permission last year so that forensic experts working for the Olympian could do their own work on it. In court, it was set up to the right of the room and was surrounded by a white border. Behind it, there was a recreation of the cubicle. 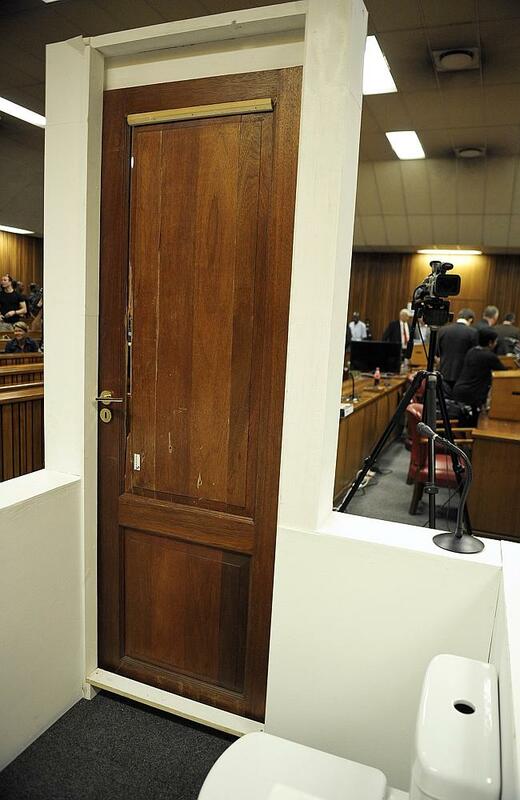 This entry was posted in Entertainment, Fashion trends and tagged Oscar Pistorius murder trial: Toilet door and cricket bat used in courtroom recreation.